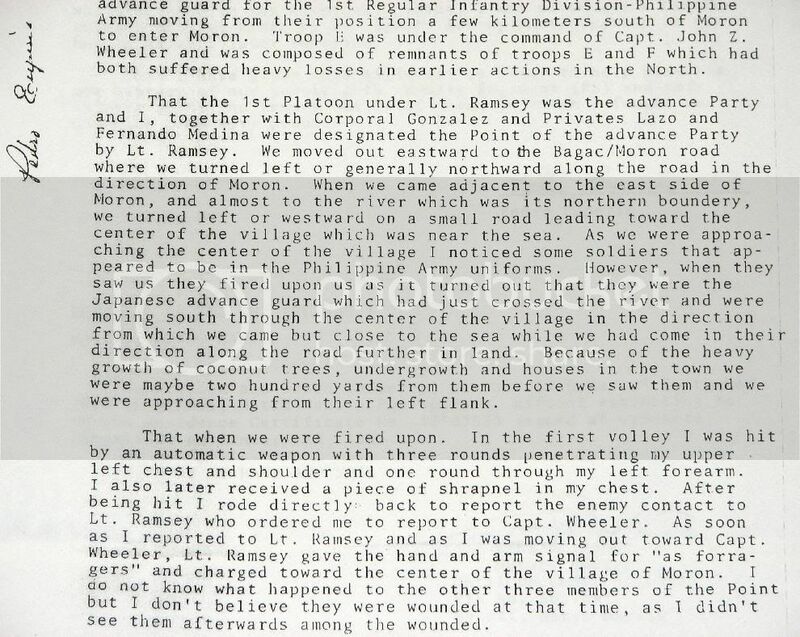 The following are pages from copies of affidavit documents sent to me by Col. Ed Ramsey regarding their last cavalry charge in Bataan. At the PSHS reunion two weeks ago, I presented present day pictures of the Abucay line to an audience of vets, family, and other reunion attendees. I don't think I had made it clear that the pictures were of locations I was able to visit and not a comprehensive presentation of the whole line. 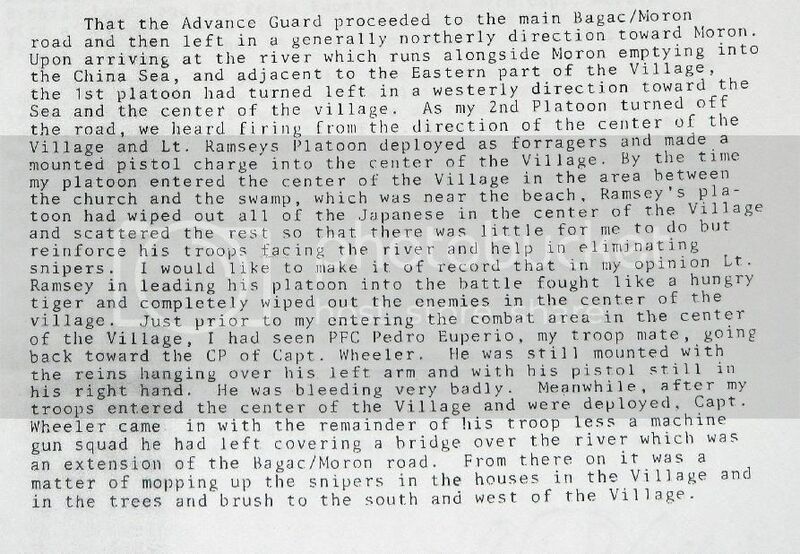 At some point Col. Ramsey asked about the western most area of the line where the 26th Cav was heavily engaged near the town of Morong. This was where the the 26th Cav made history as having made the US Army's last horse cavalry charge. Well I reiterated to everyone that I was only showing pictures of places I was fortunate enough to have visited and that I hadn't been to Morong yet. I did mention that when I go back next year, that I'd visit Morong and take pictures. He seemed disappointed that my presentation didn't have anything on the area they were engaged in. After the presentation, Col. Ramsey asked me to make sure to touch base with him for a few minutes before the reunion was over. He even joked around to Rudy that he was going to "straighten me out." He basically just made sure that we had each other's emails and said he had some research documents to send me. Today, the documents arrived and I'm posting the information for historical record, keep the memory alive, and to help out other possible researchers. They are affidavit statements made by then Sgt. 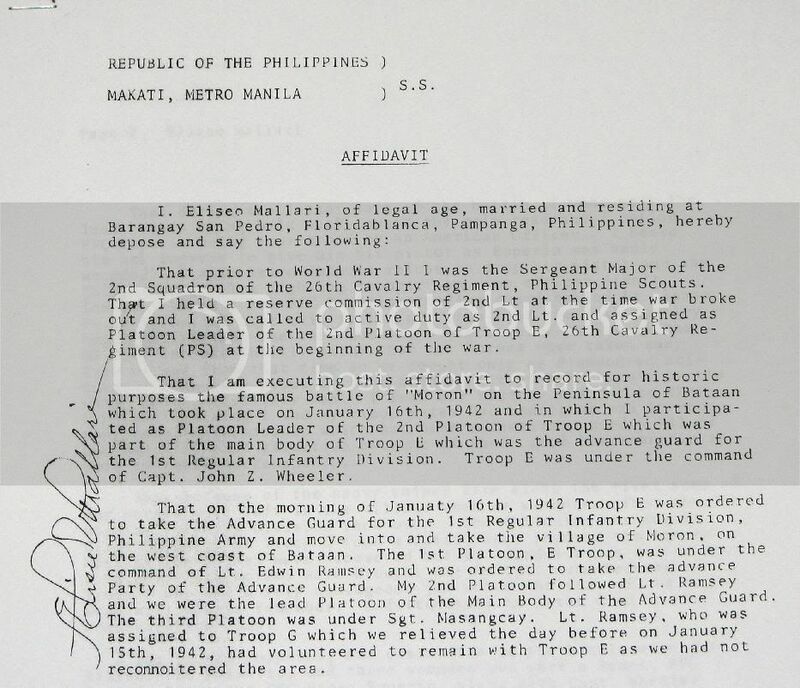 Major Eliseo Mallari who commanded the cavalry platoon that followed Col. Ramsey's point platoon that made the charge into Morong. 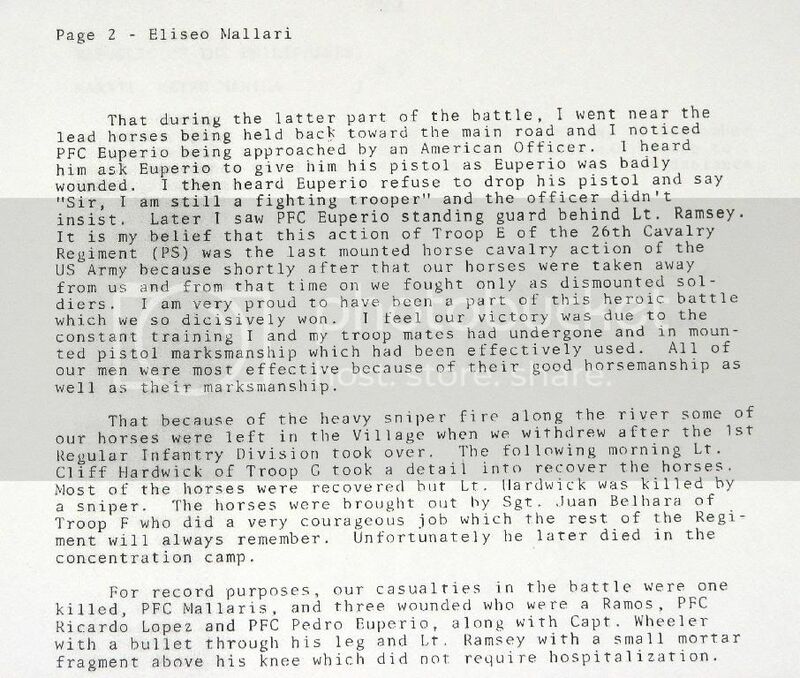 The other affidavit is by PFC Pedro Euperio, the point cavalryman for Col. Ramsey's platoon, who was shot at and wounded by the Japanese right before the charge. In 1985, while I was still living in Manila, as a result of a question from Col. Jim Spurrier, then President of the U.S. Horse Cavalry Assn., as to any supporting witnesses as to the supposed Last Cavalry Charge in the Battle of Morong, in Bataan, on Jan. 16, 1942, I started inquiring as to any living veterans of the 26th Cavalry Regiment, Philippine Scouts (PS), who might have information regarding that battle. I learned of two men alive who were members of Troop E/F, a consolidated troop due to massive losses, which was the troop I had volunteered to lead into that action. 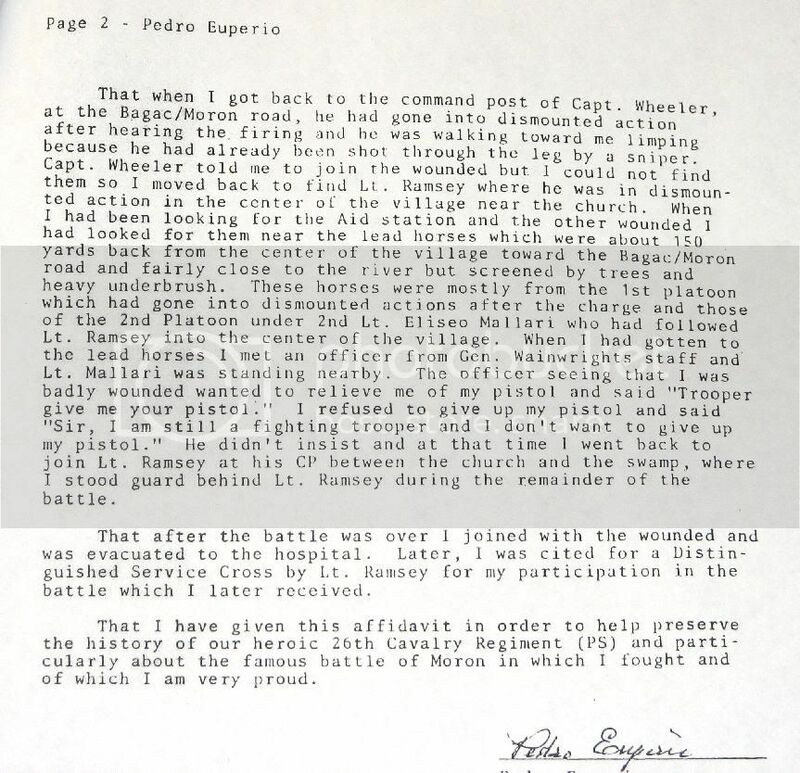 As an aside, Captain John Wheeler, who was Troop E Commander, submitted a citation for me for the Distinguished Service Cross while he was in the hospital following the battle. Unfortunately, the Chief of Staff of Gen. Wainwright who came in to observe the battle after the Charge was over but while the dismounted battle was still going on, cited me for a Silver Star before Wheelers citation for a DSC was received and thus I got the Silver Star instead of the DSC for that battle, which Capt. Wheeler told me a few days later when I was admitted to the hospital, that it was coming. Sadly, Wheeler died on one of the Hell Ships. I learned that PFC Pedro Euperio, an enlisted man in the 1st Platoon of Troop E, was still alive and living in Urdaneta, Pangasinan. He was the same soldier, who was in the Point in advance of me, that I had sighted for a Distinguished Service Cross for his heroism in the battle of Morong and about whom I have written in Lieut. Ramsey’s War. I had cited him while I was in the hospital and supposed that he had died from the severe wounds received during the battle. Surprisingly, he lived and received his DSC. I contacted him and he came to Manila to execute an affidavit regarding the circumstances of the battle and the Last Cavalry Charge. He executed an affidavit as to his recollection of the event, a copy of which is attached. 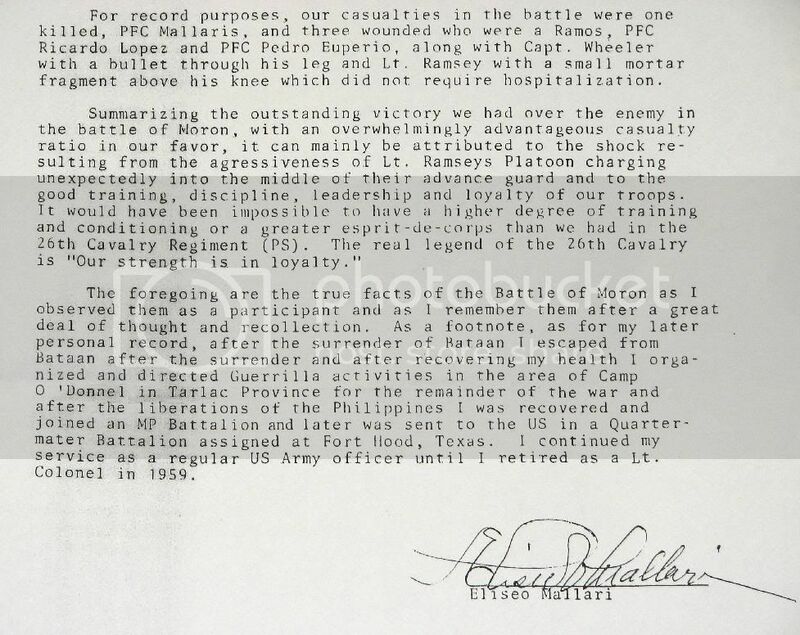 I also learned that the former Sergeant Major of the 2nd Squadron of the 26th Cavalry Regiment, (PS), Eliseo Mallari, was still alive and retired in Pampanga as a Lieutenant Colonel in the U. S. Army. He had been a 2nd Lieutenant in the reserves and called to duty at the beginning of the war and was the Platoon Leader of the 2nd Platoon of the troop and followed directly behind me leading up to the Charge and the Battle. 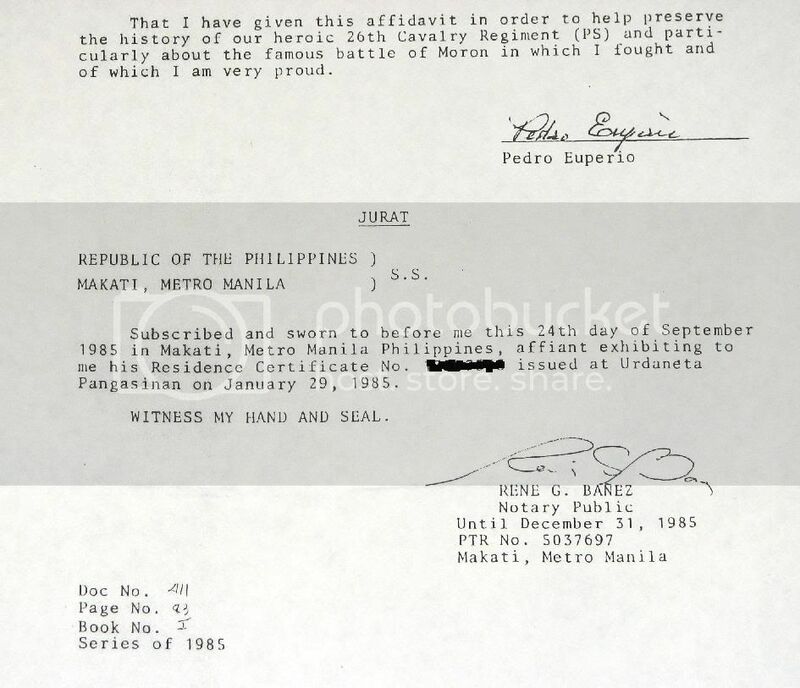 He observed the Charge and the battle and came to Manila where he executed an affidavit as to the event, a copy of which is attached. 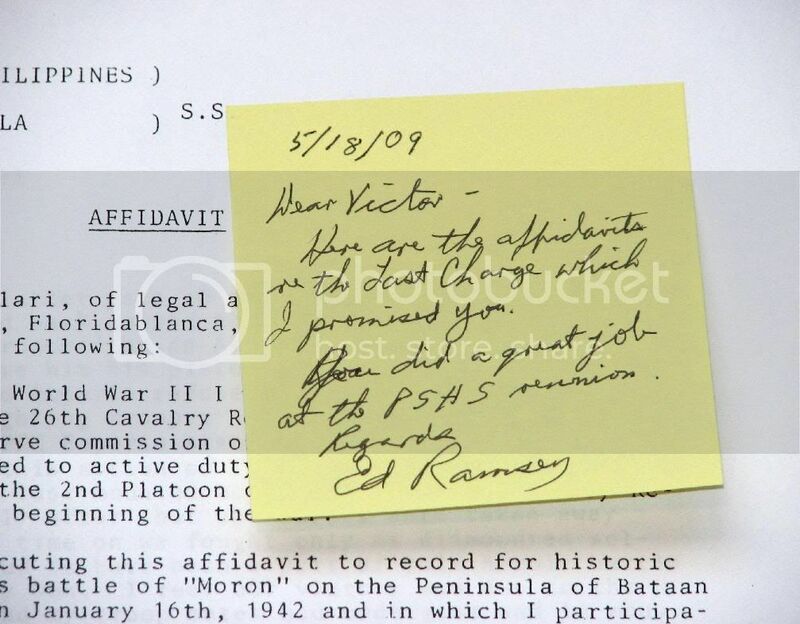 Copies of both of the above action report/affidavits were sent to the United States Cavalry Association and should be in their archives. What an Honor to get these from the man himself. It was fun to see you mention what I said he was going to do to you. Him whispering in my hear that you were so wrong and will be straighten out, is one of my memorial points of the reunion. 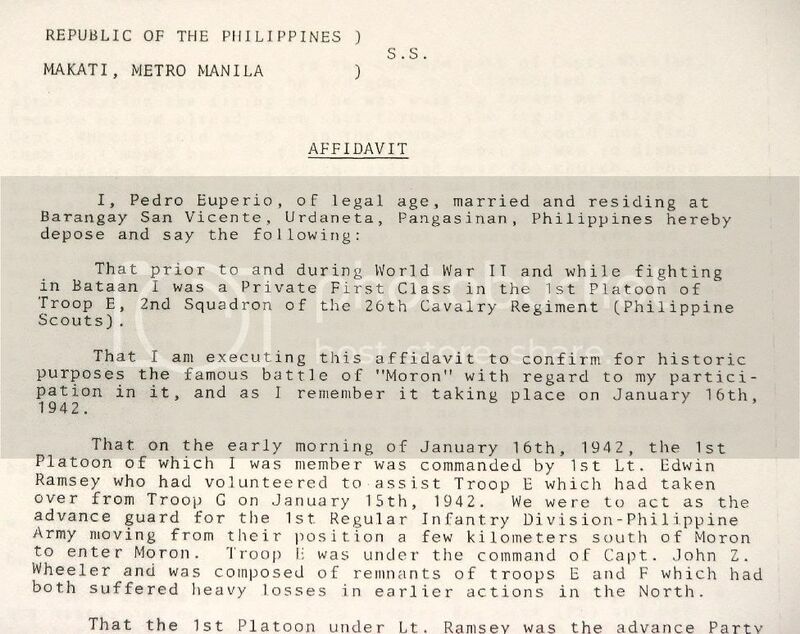 hey vic....i certainly aint attempting to nit pick edwin ramsay, but the heroic actions of his unit at morong had no connection to the abucay line as i understand it. correct me if i am mistaken, but the western end of our first main line of resistance on bataan was anchored at mauban (I corps under genl wainwright) and that position was outflanked in the same manner that the eastern sector (II corps under genl parker) was turned. the way i have always understood it was that the II corps position was what we know as the "abucay line". i realize this is minute stuff, but i just wanted to get it out there. your presentation at the reunion was closer to the actual way things played out than the way lieutenant ramsay remembered/ no big deal though. also, did you note my post from yesterday ala juanita redmond,etc in which i remarked that lieutenant edwin ramsay was an illustrious ROTC graduate from the military academy that was located in my home town, claremore, oklahoma? ? Okla, you picked up on that. Yes I was a little confused as to what... to put it... he was dissatisfied about in the content of the presentation. I just assumed I did not do a good job of making it clear that it was not a comprehensive coverage of all the battle areas... heck I don't even know how to get to the points. In the end I just assumed he was a bit disappointed that his area of battle was not presented on but I did say I'll visit Morong next year when I go back. And that's probably why he wanted to give me more information -- to give context to the place when I visit. I saw your post about him going to an Oklahoma military academy. Isn't that where he put a dead snake on an upperclassman's bunk or something to get back at him? hyuk hyuk... if I were that upper class cadet... it would have worked on me. I'm scared of snakes. So it's a non-military coed school now? hey vic....one last thing about the "last charge". somewhere, either on this website or the corregidor board, there are pics of the village of morong and area that show the route the 26th took in their dash thru or into the town. you, may very well have been the poster. you also may be aware of these photos and have looked them over. if not, i betcha you would find them interesting. i am not computer savvy enough to dig them up, although i am a retired computer operator, i am so obsolete computerwise that its embarassing. also, i am too lazy to start going over each and every topic and post. thats why i let folks like you, fots, phantom, battery boy,EXO, mapmaster, johnbryan and a host of others to keep me abreast of things. i just sit around and kibitz if nobody minds. old age does have its advantages and perks, methinks. cheers. postscript....yes, the institution is now called rogers state university. in fact, i passed by the campus this very morning on my way from tulsa to the claremore cemetery for memorial day flower placement. when next you visit with colonel ramsey, you might tell him that you know all about his old alma mater back in oklahoma. Oklahoma Military Academy was at one time (1920s and 30s) very highly regarded by the US war department. not in the same class as West Point or Virginia Military Institute, but very well rated in their class of school. after the war things just began to erode, especially since OMA was geared to horse cavalry. it is now just a nice, regional, coed college serving northeastern oklahoma. Here it is. I posted it in the book section back in 2006. I read the account of the engagement and looked up satellite images of Morong, Bataan. I tried to picture and trace the flow of the skirmish based on the descriptions and came up with this. The blue arrows are how I understand the direction of the Lt. Ramsey's attack went. "There were three trails branching left off the road through Morong toward the sea. I signaled column left at the middle one, deployed the platoon in column of squads of eight men each, and gave the command to raise pistols. We watched as the point riders entered the town. There was silence as they made their way among the thatched huts. I ordered the troop forward. Morong looked deserted. The huts stood empty on their bamboo stilts, the pens beneath them long stripped of livestock by the retreating Allied army. The village center was the Catholic church, its only stone structure, and it too was closed up against the advancing Japanese. Beyond lay thick groves of coconut palms inclining through a swamp toward the sea, while to our right crossed by a single wooden bridge, was the narrow Batalan river, the line that Wainwright wanted to occupy. We moved carefully toward the village center, the horses maneuvering head-high among the woven huts, the men alert for movement. I watched the point guard turn in at the church square and disappear from sight, and then there was an explosion. Rifles and automatic weapons burst out from the center and northern end of the village, echoing among the huts and sendingjungle birds screaming.In a moment the point men came galloping back, one of the privates streaming blood across his horse's neck and flanks. An advance guard of the Japanese army had crossed the river and was passing near the church just as we had entered the village from the side. Now I could see scores of Japanese infantry in brown fatigues firing from the village center, and behind them hundreds more wading the river and crowding toward the Batalan bridge. In a few minutes more, the main body would be flooding across to seize Morong. Over the rattling of gunfire, I ordered my troopers to deploy as foragers, and raised my pistol. A charge would be our only hope to break up the body of Japanese troops and to survive against their superior numbers.For centuries the shock of a mounted charge had proved irresistible; now the circumstances and all my training made it instinctual. The charge broke clear through the advance unit and carried on to the swamp, where we dismounted and grabbed our rifles from the scabbards. I threw out a skirmish line of one squad along the river to keep the main column from crossing and led the rest back into Morong to search for snipers." As always Vic, really good stuff! Thanks for sharing! 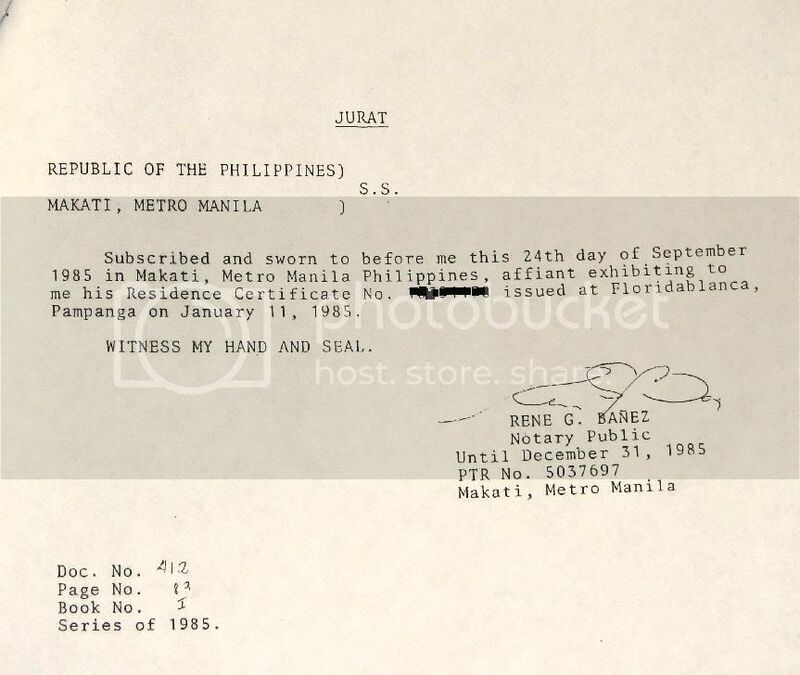 hey vic....i just knew that your fingerprints were all over that initial posting about the morong action. many thanks for bringing it front and center once more. methinks, i will start bookmarking the stuff that i would want to refer to in the future. as john said, "really good stuff". I am amazed and admire your dedication to the PS guys. When I was in High School, I used to read about WWII from my father's book collection but mostly ETO and a few about the Pacific War ( Guadalcanal, Iwo Jima, etc. ). I hate to admit that I was ignorant about Bataan / Corregidor details and has never heard about the PS until after I got into airsoft and met people with passion for WWII history which in turn led me into this forum ( late last year ). This started me to do WWII impressions and I am proud to say that my PS impression has been completed. Now this last cavalry charge is getting me excited. A 26th Cavalry impression is not far behind. Every night, I look forward to this forum to read and learn from your discussions and researches. Good morning everyone ( It's 1:45 am in Manila ) I will retire but I will see you all again tomorrow. Bulikiti, thank you for saying that. It makes running the forum all worth it. A 26th Cav impression for airsoft can use a WE1911 You'll need a pair of these boots but you can probably have them made cheap there in the Philippines. How else can we fan your interest in your newfound interest in the 26th Cavalry? Maybe these pictures and videos... they're not specifically the 26th but the 26th vets who saw these videos (courtesy of Rudy Cabigas) said they did the same exact things in the 26th. Ha Ha. We had Liwayway, Wakasan, Hiwaga, Pioneer komiks, etc in my generation. There was a series entitled DIGMAAN. That's as far as I can recall. All the rest are FPJ movies mowing down a battalion of those Japs. Probinsyano kasi ako. Kidding aside, I remember one of my lolo telling stories about the death march. He said he hid under the saya of an old lady. I didn't believe him then until long after he died ( though I still doubt the "under the saya" thing). After graduation I came to work in Manila. One of the neighbors who is also a Bicolano and a distant relative, told me he serve with my lolo in Bataan. Mariveles to be exact. My lolo was a Merchant Marine Captain. I check his records and indeed he was listed. That was how I got my Lola a green card at the Veteran's Memorial Hospital in QC plus an affidavit from a living witness attesting to her being the spouse of a war vet. Those pants they are wearing, are they called "riding breeches"? What is correct for a PS Cavalry impression? Pardon my ignorance. Those pants they are wearing, are they called "riding breeches"? What is correct for a PS Cavalry impression? The Philippine Department patch we used just to indentify us a Philippine unit for the uniformed Public. But was not worn i the field. Everything else except is standard US Army issue. The bolo bayonet was also a unique issue to the 26th. And the M1 Garand rifle! hope this helps your gear and uniform together. 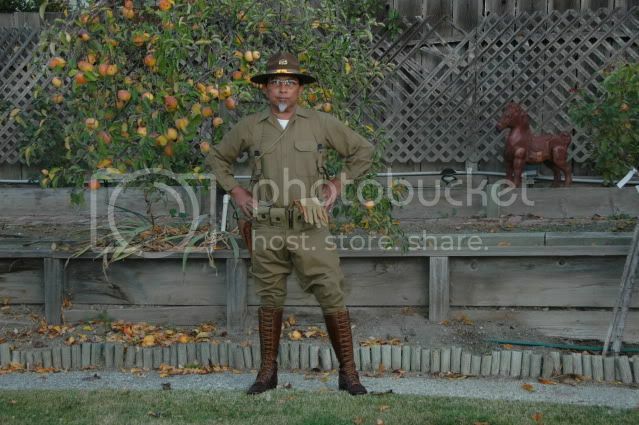 Hi, this is my uncle's 1940 period 26th cavalry impression. Hope this helps. I do two different periods of the 26th cavalry. I also do my dad's 1923-1926 period. This period had a different saddle, leggings, shirt and rifle. I will post that after you see this so you can see the difference. Thank you guys. Lacing the M31 mounted boots looks like a daunting task. 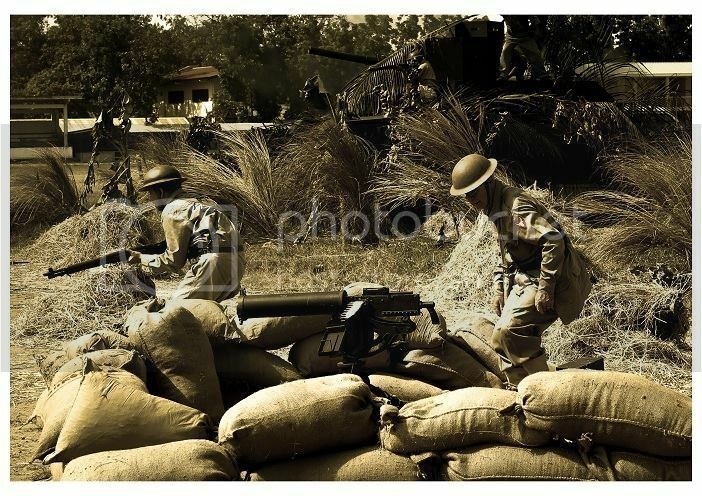 Was the M1940 ever had the time and chance to be worn in the PI? How about the M1911 leather puttees? Sorry guys, I am trying to find an excuse not to wear the M31. Ha ha.. I am going to hurt my back putting it on. Getting the horse is another problem but imagine the thrill "airsofting" in cavalry uniform with two pistols blazing. I have 2 1911 pistols and has been practicing shooting with both during pistol games. Also, was there a BAR man in the cavalry? Believe me. Putting canvas leggings on is 10x harder than putting on 1931 boots. But yes the 1940 boots were around but according to Col. Ramsey, only some of the officers had them. The enlisted men wore the lace ups. But for airsoft... the 1940 boots will work. Two pistols blazing? I think that's the Matrix you're talking about haha! A cavalry impression for airsoft is tough. First you're limited to a 1911 and the garand. I'm not sure they used the BAR like how the paratroopers didn't use them. They had heavy weapons platoons. A cavalry impression may be best for photo-ops and "japorms" topic of conversation. Since the thread has taken on a reenacting/impression theme... shall we branch off and continue in the reenacting/WW2 area of the board? It's all cool.